Located under Settings -> Tax, system allows up to 5 taxes configuration. Tax inclusive, tax exclusive and surcharge. Tax Inclusive = tax is already included in the product price. Tax Exclusive = tax is not included in the product price. It will be charged on top of product price. Surcharge = In tax inclusive situation, additional amount that is added on top of product price. 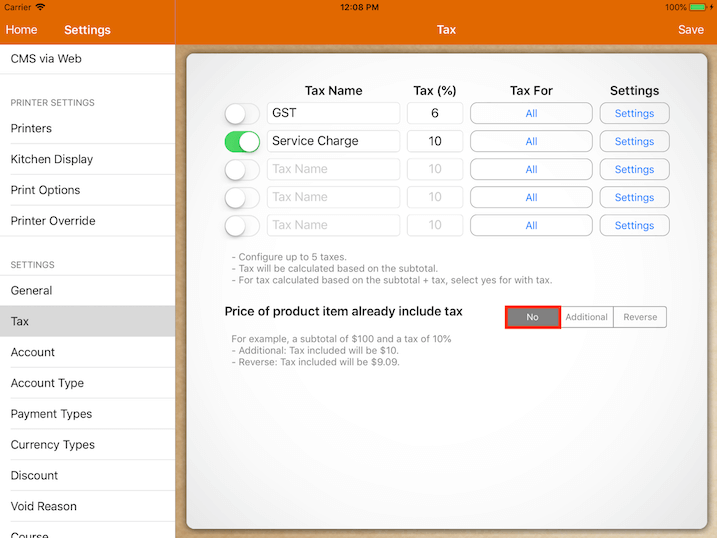 For each tax, user will need to insert information like tax name, tax percentage, tax for and settings. For Tax For option, user is required to decide which transaction type this tax will be applied to. Options available are: All, Eat In, To Go and Payment Surcharge. User can only choose one to be taxed for each tax set as shown below. All - Tax set up is applied to all of the transaction type. 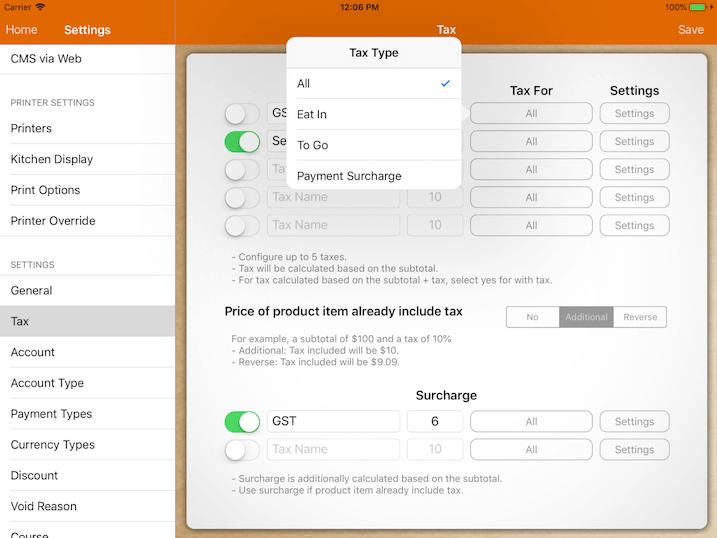 Eat In - Tax set up is applied to dine in orders only. To Go - Tax set up is applied to take out or take away orders only. Payment Surcharge - Tax set up is applied when a certain payment type is applied. (eg.credit card payment). 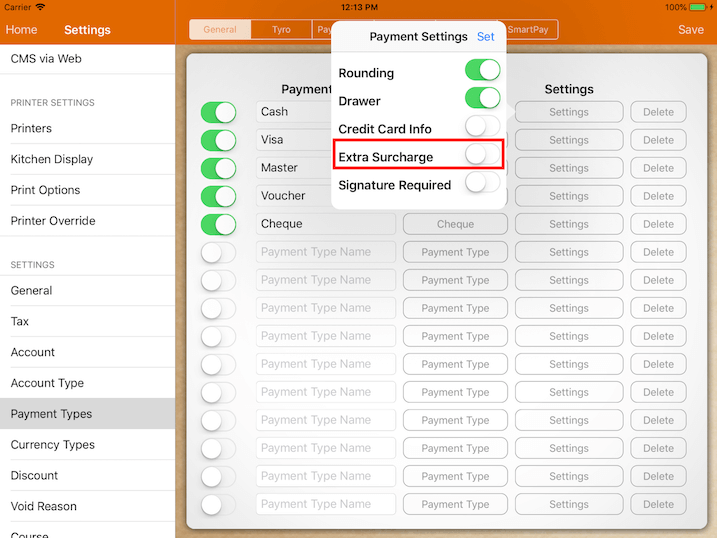 In order to enable payment surcharge, user will also need to go to Settings -> Payment Type. At this page with the selected payment, enable the "Extra Surcharge" button under the "Settings" column as shown as below. With "Extra Surcharge" being turned on, when this payment is selected for payment, payment surcharge type tax will be applied to this bill. For "Settings", there are two tax settings. With Tax and Tax Before Discount. User can turn on the switch if it's applicable. Then, tap on "Set" button as shown below. For With Tax option, the tax imposed will be on top of the previous total amount including the tax. 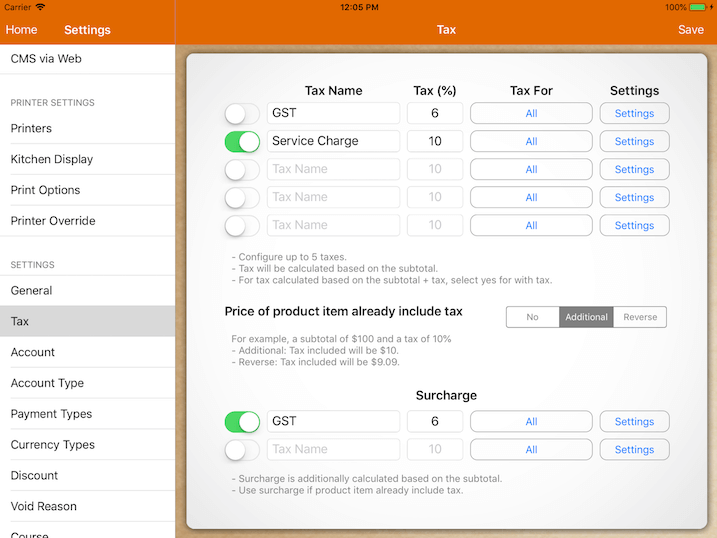 Do note that the "With Tax" option will only be implied starting from second tax onwards. In this example you can see that on the second tax, it will tax based on the first tax as well. In this example both tax amounts the same. For Tax Before Discount, it applies the tax on the product price before it is discounted. 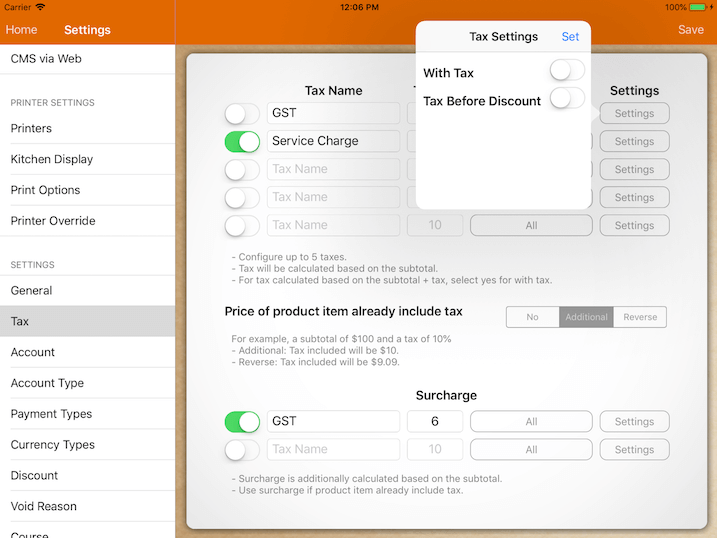 For Settings, there are two different setting options, With Tax and Tax Before Discount. Both setting options can be enabled simultaneously. 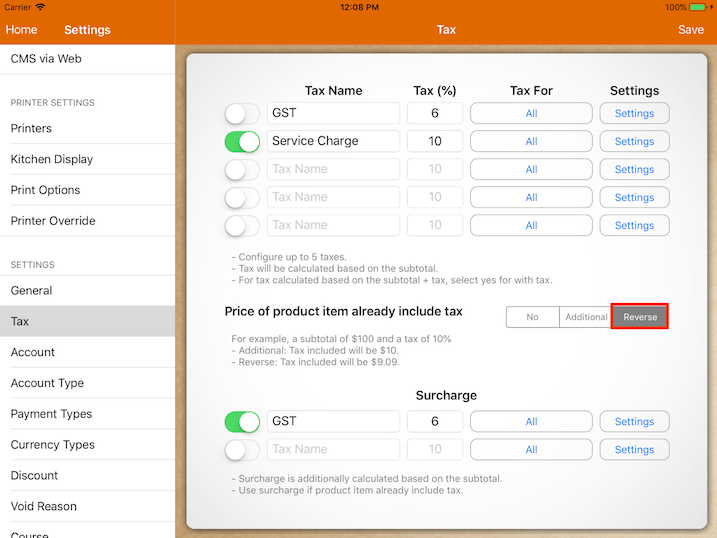 For tax exclusive setup, set to No under the section of Price of product item already include tax. By doing so, tax will be imposed and charged on top of the total amount. For tax inclusive setup, there are two variants: Additional or Reverse. The total tax calculated or included in this product will be $1.00. The total tax calculated or included in this product will be $0.91. In another way, the actual product price is $9.09, after adding a 10% tax on top of it, the product price becomes $10. In Additional and Reverse tax situation, product price already include tax. 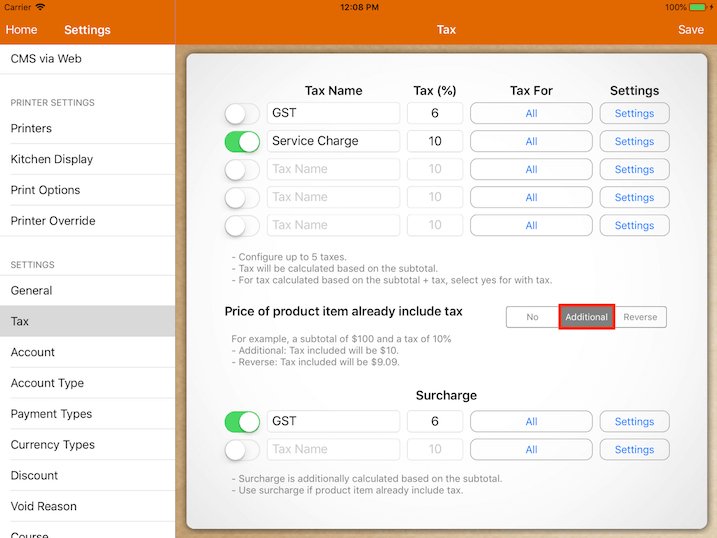 However if user decides to charge additional tax on top of product, surcharge can be used. An example to this would be holiday surcharge, as it is charged on top of the product. Total payable in bill would be $11. 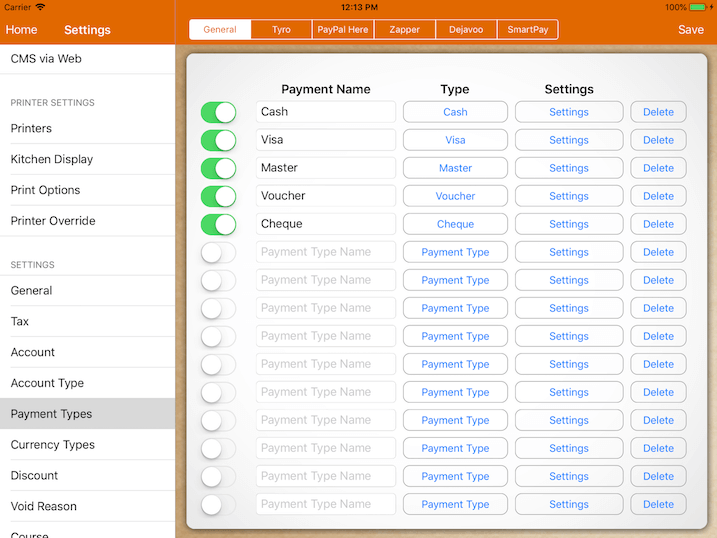 MobiPOS supports only 1 tax system across the entire menu. Which means if you decide to have tax exclusive setup in your menu, you cannot have certain product to be exclusive and certain product to be inclusive.